Last year around this time, I introduced the Rubies Jabba the Hutt costume, which is to my knowledge the only commercially available Jabba the Hutt costume ever made. This year, I decided to try my hand at pumpkin carving. This was my first time using a dremel rotary tool on a pumpkin, and it was actually harder than I had expected it to be. Maybe it was my off-brand tool, but most of the heads I put on it didn’t really seem to work very well. I did finally hit upon one that worked okay, but I didn’t have nearly as much control as I wanted, so I struggled a bit. And of course, the kitchen table and I were totally covered in tiny particles of pumpkin by the time I was finished. Interestingly, the heat generated by the spinning dremel head apparently is enough to cook the parts of the pumpkin that you are removing, because there was a definite scent of pumpkin pie. 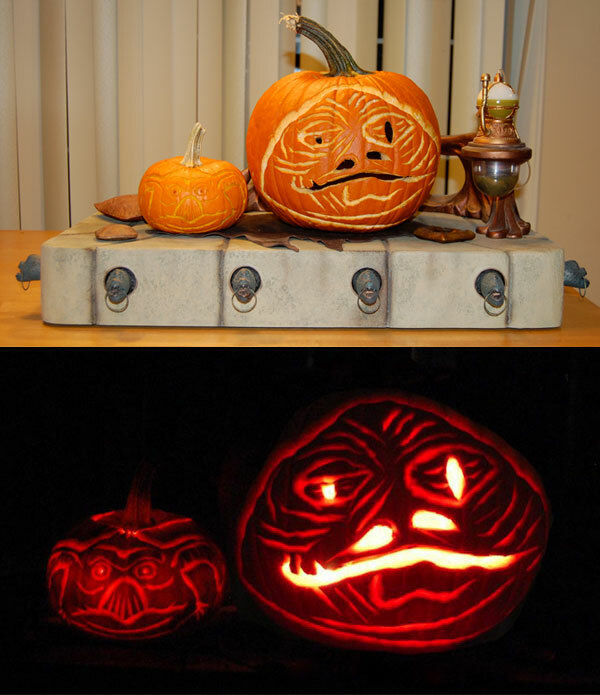 I put the two of them on the Sideshow Collectibles 1/6 scale Jabba throne, since I thought it would be cute, and also I submitted them to Sideshow’s Spooktacular pumpkin carving contest, so it seemed appropriate.